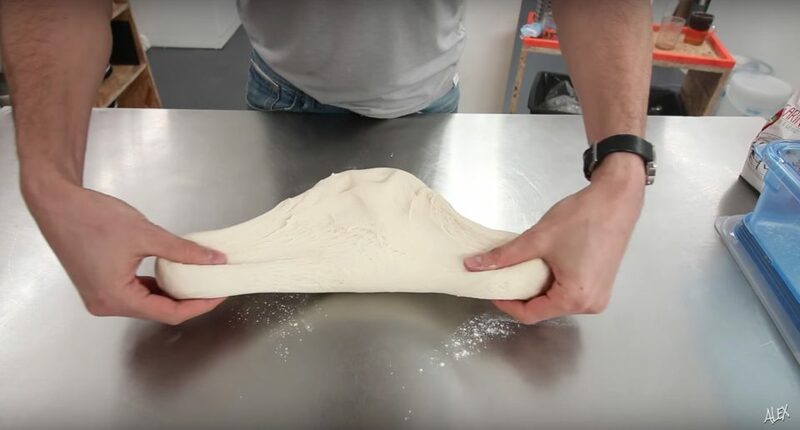 Here is a super legit recipe to make great and reliable Pizza Dough at home. That specific version makes for 3 large pizzas at the end, with a 70% hydration. In a big bowl, add 365 grams of water. Dissolve 16 grams of salt. Add 50 grams of flour and mix it well. Add 1 gram of fresh yeast or half a gram of instant yeast. Gradually add the remaining 470 grams of flour. Knead the dough for about 20 minutes or until smooth. Cover and let it rise for 2 hours at room temperature. Divide it in three parts and form dough balls. Let them rise in an airtight container for 6 hours. Bravo you just made my super legit pizza dough. I’m a huge Home pizza lover. I’ll definitely give this a try! Avec cette recette et un four électrique domestique, à quelle température et combien de temps suggèrerais-tu de laisser cuire une pizza type margherita s’il te plaît ? Olive oil. It needs some extra virgin olive oil. It won’t taste right without it. I’m also curious about the no oil situation. I must try this! I also like to dust the bottom of the pizza dough with corn flour just before adding toppings and baking. When is the video for this coming out? Come on! Also, much respect for adding in an automatic calculator to adjust the values depending on the number of servings, why is this not on all online recipes??? You made my day by giving wonderful blog how to make the pizza base. And Who doesn’t love pizza? It’s the ultimate comfort food, isn’t it? Could you also add oven temp and bake time ? I can not help myself, … I read even your website in your French accent in my head :D.
Tank you for this calculator. Makes making pizza tonight much easier :). Btw. I used to make Youtube Videos as well, but since there are 2 Kids and 3 Jobs it is hard to find the time for this passion. You live my dream. Greetings! i wanted to make 5 pizzas, but allthough i put exactly the amounts from the calculator in the dough it was super liquid and suuuuuuper sticky. what did i do wrong? ive had to add at least 300 gramms of flour to make it a shapeable dough. Bug Report: When increasing the number of pizzas, the measurement of Instant Yeast remains fixed at “or 0.5g instant yeast” and does not increase like the rest of the ingredients do. Apart from straight errors in measurement, I can think of one thing: the content moisture in flour might vary. So if the moisture content is high, less water may be needed.